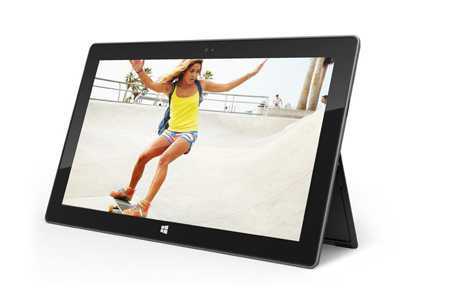 Microsoft Surface PRO – A Game Changer? KillerStartups > Startup Tools & Guides > Microsoft Surface PRO – A Game Changer? I usually start-off these reviews talking about the fast evolutionary pace of technological innovations, which is particularly true in the tablet space. Although now, the tablet market place is becoming increasingly vague where manufacturers are producing devices that overlap both the tablet and ultra-book categories. Often referred to as the “post-pc era” of devices; I believe these play a strong role in the community today. For Startups and particularly Internet entrepreneurs having constant access to online data may be critical towards the firms’ growth, success, and management; frankly carrying a full-fledged notebook isn’t always going to be the ideal solution. In this market, it’s never really been about the power or specifications of the devices, its always been focused around user experience. Each device in this category is aimed at a slightly different set of audiences and you have to find the right one for you. Android Tablets: Google’s Recent announcement the Nexus 7, Samsung’s Galaxy line up and a hand full of other Android devices (Motorola Zoom, Sony tablet). For the past half decade there has indeed been a device in the middle; a diverse category of tablets that were aimed to do certain, limited tasks better then its elder brother, the PC. E-readers are just the simplest way of taking your reading with you and color tablets are ideal when it comes to viewing videos and reading emails; simple tasks just didn’t need the extra complexities of a notebook. With these design intentions however, it has always been a category of device with many constraints. For example you could never really write code on them, sharing was always limited, and the devices’ applications were literally core to its success. The new Microsoft Surface PRO isn’t that device in between! 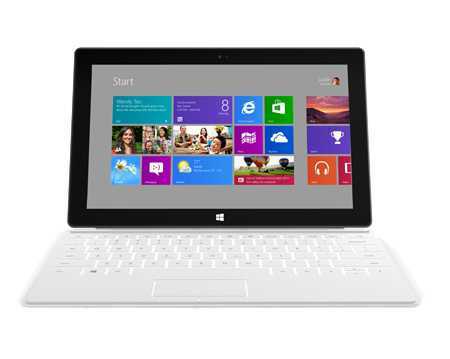 It is everything you already know and love about your workhorse (Windows 8 – Operating system) and at the same time it offers you all the portability benefits of a tablet. There’s almost nothing new to learn; it’s literally like carrying your PC with you. I’m not going on a limb to say that there aren’t brilliant mobile apps, but every once in a while you’d miss having the ability to fulfill your computing experience. The Introduction of the Microsoft Space blurs the gap between the tablet and notebook categories, to possibly create a entirely new market. So now you can do everything you would on your PC, run windows OS complete with all the applications, and still enjoy the portability and form factor of a tablet. There’s a lot lying on the shoulders of the Surface PRO; Microsoft’s use of a brand new manufacturing process, a release of the next generation of Windows (Windows 8), promising the best of both the tablet and PC realms and even guaranteeing a solid digital inking experience for note taking. There will be 2 models offered an RT and a PRO version; (The RT will not run a full version of Windows and will not sport a Intel CPU, it will remain more geared towards its other tablet rivals). The devices will have 2 different options of magnetically attached top covers, which are also full keyboards; a soft touch cover keyboard, and a traditional type cover keyboard. Its always been a pain to type on touch screens regardless of the screens accuracy, and Microsoft has finally addressed this issue, of course the accuracy of the soft touch cover is still to be tested as it works by sensing pressure applied at particular points. The Device will also have a kickstand, which I’m sure a lot of you will appreciate particularly on a work desk or when viewing videos. 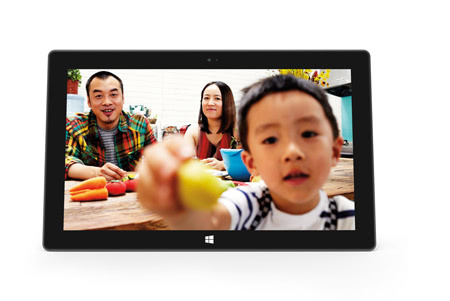 The Surface gets a full HD (1920×1080 pixels) resolution display, great for all your multimedia, and HD rear and front facing cameras for video calling. Its also using a new process known as optical bonding which reduces the space between the screen and your fingers to 0.7mm, the display is at the surface of the gorilla glass, allowing for a more natural feel during interaction. Microsoft put a lot of thought into this device using 2 separate digitizers, one for the stylus and another for touch gestures; so when the stylus is near the screen the touch digitizers goes idle in order to avoid accidental gesture responses. A lot of its design compactness is possible due to leaps in Intel’s new 3rd generation of Core-I Series processors, which is helping make computing more efficient, while reducing its power and size foot print; so I wouldn’t be surprised if the Surface has lots of new competitors in the year ahead. But since it is the first time such a challenge has been taken up, there are a lot of potential problems. Using a notebook processor on a tablet-like device might cause the following . . .
Of course none of these can be confirmed until the device is actually launched, later this year; but many issues were un-announced during Microsoft’s unveiling of the device. At the end of the day the Microsoft Surface brings about a hand full of tech innovations, which will definitely push the industry to think about this category of devices in a different light. It will be interesting to see how the devices success pans out post its official release. However, combining the computing abilities of a PC with the portability of a tablet is sure to redefine consumer expectations.